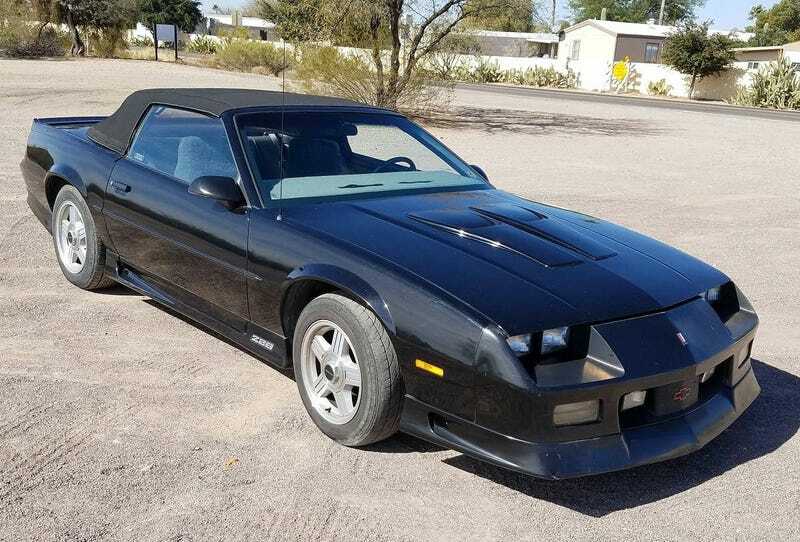 At $6,000, Might This 1992 Chevy Camaro Z28 Put You Back In Black? While silver is the traditional 25th Anniversary gift, today’s Nice Price or Crack Pipe 1992 Camaro—which marks the model’s 25th year—is black on black. Let’s see if this manual-equipped droptop’s condition and price have you giving up the green. The 6.5-litre turbo diesel powering last Friday’s fairly rare 1995 Chevy Tahoe two door with rear barn doors has a long and illustrious history in marine application. Luckily for the seller of that tidy truck, 76-percent of you didn’t think its $4,800 price meant taking a bath with its purchase. That Nice Price win meant that we only had one loser last week, and that was even with a Lancia in the mix! Let’s see how this week pans out, shall we? I know we’ve been leaning hard on the ‘90s Chevys of late, with two just last week. That was fully 40% of the week’s inventory. Today’ we’re going to do one more, and then I promise we’ll have a respite. The thing of it is, I really want to know all of your opinions on this one, which is a 1992 Chevrolet Camaro Z28 convertible. This generation of F body is generally considered to be one of the—if not the—prettiest of them all. It was also the first in Chevy’s pony car line to drop its top since the initial model. This 1992 convertible represents the final year of third-generation models, and also—with the closing of GM’s Van Nuys, California plant that same year—the last Camaros built in the United States until 2015. That year was the Camaro’s 25th, a pretty auspicious anniversary. A special edition with a hot mill featuring heads from the ‘Vette and an available six speed was planned in honor if the achievement. That was eventually scrapped, however, because of reasons. Instead, all ’92 Camaros simply got a dash plaque to commemorate the accomplishment. Yay? So, no ‘Vette mill for you. Well then, just what then does this car have under its impossibly long and phony scoop-clad hood? Resident here is a 305-CID V8. Yeah, that’s not as exciting as a 350, but it’s really not all that bad. In the Z28, the 305 got a nice little power bump from RS form. That meant 205 horsepower when equipped with the automatic. When kitted with the five-speed stick, as in the case of this car, the 305 wrangles up an additional 25 horses. That gives it a total of 230 at a mid-level management 4,200-RPM. That’s on regular gas for those of you counting your pennies. Add to that the opportunity to put the top down and this middle aged Camaro could make for a pretty decent cruiser. That is, if you can get the top down. The seller seems pretty honest in his description of the car, and in that description he notes that the top needs two parts replaced. What those are goes oddly unexplained. Other issues here are a passenger door window that’s apparently a member of a French union, and an A/C system that needs more R134 (it’s been converted, he says). The bodywork looks fine, with no rust or major damage apparent. The paint however, is a bit dull, and there’s significant sun bleaching on the back bumper. The back window in the soft top is also ugly as a bruise. That’s generally the lot in life for an Arizona car. Inside things are also hit or miss. Overall it looks decent, although who’s to say what’s going on under those Pep Boys phony sheepskins on the front seats? The vinyl on the back seats looks to be just fine, but raises the point that no one is ever intended to sit back there for any length of time. It’s claustrophobic’s nightmare back there, especially with the giant expanse of the top enveloping it. A carpeted cap only accentuates the depth of the dash, but it seems to be appreciably stock under all the soft stuff. Factory alloys underpin, and the seller notes that the car rocks 128,585 miles, ‘runs good,’ and possesses a clean title. That’s pretty much all we can tell from the ad. The VIN that seller offers —T226027053018—doesn’t actually appear to be a VIN. I’m pretty sure it should be something a little more like this. Whatever, we’re not here to VIN-dicate the car, we’re here to judge its potential purchase. To do so, we need to consider its $6,000 price. That’s not a lot of cash for many, but raises the question, is it a lot for this Z28? For $18,000, Is This A Bitchin’ Camaro?